The number of diverse factors implicated in the etiology of Alzheimer’s disease (AD) suggests that it can arise through distinct cascades of pathophysiologic and molecular events. These include specific genetic defects involving amyloid precursor protein (APP) and its metabolism, aging itself, prior history of head trauma, and ApoE. Of these, only aging impacts on a majority of all AD cases (1–5). Considering the multifactorial nature of AD etiology as well as the number of afflicted individuals (approx 4,000,000 in the US alone), it is noteworthy that the almost universal symptom for all AD patients is early memory loss (6,7). 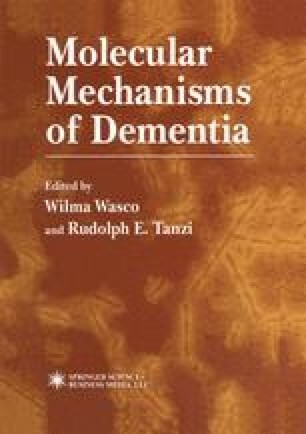 Characteristically, other dementias are revealed by constellations of symptoms, such as motor deficits with Parkinson’s disease, Huntington’s Chorea, and Wernicke-Korsakoff’s syndrome; sensory deficits of vitamin B12 deficiency; and mood alterations of depressive disorders (8).